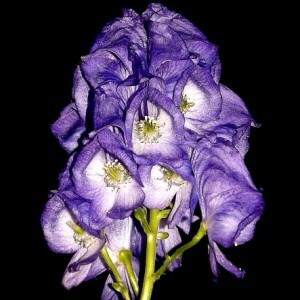 Aconitum is a sort of poisonous perennial grassy plants, which includes about 330 types. Akonitum is remarkable, first of all, for its poisonous (from roots to pollen on stamens) and constitutes serious danger to ignorant people. The plant under the name "Akonitum" (in translation from the Greek Aconae – "the rock, the rock" or Acontion - "arrow") was known still ancient. And, probably, there is no other such plant about which so many legends and myths are put. There are some legends concerning Akonitum's origin. It agrees the most popular of them, the mythological Ancient Greek hero Heracles during the eleventh feat brought out of a kingdom the Aida of a three-headed dog of the Cerberus. On an earth surface the terrible guard was frightened of a sunlight and began to escape without restraint. From rage and rage at it the poisonous saliva began to flow and filled in the earth and a grass. In those places where it got, began to grow high killing plants. A dog not to frighten people, Heracles took away back in an underground kingdom, and Akonitum remained safely to blossom and smell to this day. As all this occurred near the city under Akoni's name, in honor of it and called a poisonous plant. Aconite. Aconite variety. Aconite cultivation.